Welcome to the July 2014 edition of the IPC e-newsletter. The IPC e newsletter is distributed free to more than 4000 people around the world. An innovative and inexpensive way to fight air pollution has been developed: a roof tile titanium dioxide coating that removes up to 97 percent of smog-causing nitrogen oxides. The researchers calculated that if 1 million roofs were sprayed with the smog-eating compound they could remove 21 tons of nitrogen oxides from the air each day. UC Riverside researchers say they have demonstrated an inexpensive roof coating that gobbles up smog-forming pollutants and, if widely adopted, could clean tons of air pollution from Southern California each day. In a laboratory experiment, engineering students found that ordinary clay roof tiles sprayed with titanium dioxide removed 88% to 97% of nitrogen oxide pollution from the air. MANILA, Philippines - The Department of Environment and Natural Resources (DENR) has partnered with the Department of Education (DepEd), the Department of Health (DOH) and the European Union (EU) to eliminate lead and mercury exposures in primary schools all over the country. Graffiti, lettering and stickers can turn public property into eyesores. To fight this problem, BASF’s Coatings division has developed the RELEST® Powder PUR Anti-Sticker coating. The product’s anti-stick surface prevents soiling and reduces cleaning costs. It was specially developed for coating light poles, traffic signal poles and circuit breaker panel boxes. “RELEST Powder PUR Anti-Sticker’s slightly roughened surface offers anti-graffiti properties. Stickers do not adhere properly to the surface and graffiti can be removed more easily,” explained BASF product manager Miriam Belke. The product also features high weathering resistance, scratch resistance and very high chemical resistance. Eurocoatings GmbH, a service provider for surface technology based in Werl, Germany, is the first company to use the anti-stick coating. “Using the powder coating on light poles offers outstanding protection from soiling and corrosion, and is a valuable addition to our portfolio,” explained CEO Klaus Merckx. The paint makers are set to have a pretty colourful bottomline by the end of the first quarter. Market leader Asian Paints and another leading player Berger Paints have both raised prices recently on hardening raw material prices, which were stable all along. With this, the paint makers have hiked prices twice in the current quarter, in May and again in June, which would be reflected in their bottomline when they report their earnings in August. However with some of the raw material prices already seen northward journey, further price hikes are largely being ruled out going ahead. "Industry had taken price increases in May and has again in June. On agregate we have raised prices by about 2% and we will see the full benefit in this quarter. Raw material prices have been stable expect some cost pressure from vinyl acetate monomer (used in water-based adhesives) and other imported raw materials. But we see stability in prices going forward and belive we won't need to go for hikes again," Abhijit Roy, managing director, Berger Paints India told dna. Asian Paints took a price hike of 1% in May followed by 1.2% in June. "We had taken cumulative price increases of 6.14% during FY 2013. There has been further increase of 1% on May 1 and again 1.2% on June 1," KBS Anand, managing director of Asian Paints, had told analysts. The price revisions came on the back of slight upswing in select raw materials, which will help the paint makers report better margins in the first quarter (April-June) if the demand scenario remains stable. In addition to rise in prices of raw materials, currency movement has also been impacting the costs of materials many of which are linked to crude oil prices. Titanium dioxide, which accounts for 15-18% of the total purchase basket of a paint company, had remained depressed for long dropping by as much as 40% in 2012-13 and then remaining stable for the whole of 2013-14. Expect pick up in volumes, demand going ahead: Berger Berger Paint has had two price hikes this year in May and June totaling to around 2.2-2.3 percent. initiated a price hike of about 1.2 percent, effective from June 1 in its decorative paints segment due to rising input costs. The company year-to-date has had two price hikes in May and June respectively, which works out to around 2.2-2.3 percent together. Speaking to CNBC-TV18, the MD Abhijit Roy says that volumes will pick up in the coming two quarters. “There was some amount of suppressed demand which should bounce back now,” he adds. Q: Can you tell us if there were any price hikes, what was the quantum? What has the price hike been year-to-date? A: We had a price hike of about 1.2 percent which was effective June 1 and year-to-date we have had two price increases so far, one on May 1 and the other on June 1. The two together will be about 2.2-2.3 percent. Q: How will this aid your margins in the coming two quarters and what is your volume growth expectation for the coming two quarters? Q: How will this aid your margins in the coming two quarters and what is your volume growth expectation for the coming two quarters? A: Volumes will look up. There was some amount of suppressed demand which should bounce back now. This being a discretionary category, there is lot of postponement happening in terms of the purchases which the demand might bring in. We expect the volumes to increase. Asian Paints adopted an automated storage and retrieval system that included paint racks 12 levels high and connected it to its ERP. Har ghar kuch kehta hai. Asian Paints’ tagline illustrates just how much a house speaks about the people who live in it and how it reflects their personality, imagination, creativity, and lifestyle in the language of color. Asian Paints should know, for over 72 years it’s been using its palette of colors to brighten up homes. Its long innings is what’s partially responsible for its success. Today, Asian Paints is ranked among the top five decorative coatings companies in the world, with a consolidated turnover of Rs 12,714 crore, and it commands over 45 percent of the Indian paint market. That’s a position it aims to maintain—or better—as the market grows to over Rs 49,000 crore by 2016-2017. Longevity, however, is only part of the reason for its success. Innovation is the other. In the early 2000s, the company expanded its product portfolio as it began to shift its customer value proposition from paints and colors to home decor. In a response that was consistent with this business move, the company increased the number of depots through which it serviced its customers. It also witnessed SKU (stock keeping unit) proliferation to offer a wider choice to consumers. Both of those trends had a direct effect on Asian Paints’ ability to forecast demand. If this is not addressed, inventory management issues would surface. Within a short while, a grim portrait of supply chain inefficiency was juxtaposed against the bright canvas of Asian Paints’ growth. AkzoNobel, Sherwin Williams and PPG were the largest companies in the market with a combined share of over 25% in 2013. Other key participants in the market include Dupont, BASF, Valspar and Nippon Paints. The Wall Systems business of BASF Corporation, a leading manufacturer of exterior insulation and finish systems (EIFS), stucco and air/water-resistive barriers, today announced the launch of Tersus Color Coat. Tersus Color Coat, a modified acrylic smooth coating, utilizes a proprietary BASF formula to produce a highly hydrophobic, non-polar surface that repels water. When water comes in contact with Tersus Color Coat, it beads and carries away dirt, soil and debris. This inherent property also makes it more resistant to mold and mildew. Its anti-soiling properties have been proven using two industry established test methods, ASTM D3719 – Dirt Collection and Miami Dade County TAS 143-95 to confirm dirt pickup resistance. Saraf Agencies Private Ltd (SAPL) has set a fresh target for commencement of production at its titanium dioxide plant proposed near Chhatrapur in south Odisha’s Ganjam district by December this year. The plant is presently under construction. The Kolkata-based company had earlier targeted to start production from the plant by May 2014. The first phase of construction on the Rs 2,000-crore project was delayed due to the devastating cyclone Phailin that struck the state’s southern coast in October last year, sources said. Coatings giant PPG industries Inc.’s (PPG - Analyst Report) North American architectural coatings business has agreed to buy Masterwork, an independent paint distributor also based in Pittsburgh. The deal is expected to close in the third quarter. However, financial terms of the agreement were not disclosed. Global demand for paint and coatings is forecast to rise 5.2 percent per year to 51.6 million metric tons in 2017, valued at $186 billion. Advances will be driven by a strong rebound in global building construction spending, particularly in North America, Europe, and Japan, fueling increased demand for architectural paint. Manufacturing and specialty coatings demand will also grow at a more rapid pace compared to recent historical trends, benefiting from an improved outlook for motor vehicle production and overall industrial output. However, gains will be limited by the increased use of higher quality coatings in both the developed and developing worlds, reducing the volume necessary to complete a given paint job. Water-based coatings and other high-solids formulations will gain share over solventborne products in virtually all world markets, as paintmakers continue to reduce emissions of volatile organic compounds (VOCs) in coatings to comply with government regulations and consumer preferences. PPG Industries (PPG - Analyst Report) is investing roughly $40 million to expand its coatings manufacturing facility in Sumare, Sao Paulo, Brazil. The expansion will facilitate the production of resin that will be used to make automotive coating products. Banish the bucket, sponge and hose. Its UK engineers are testing innovative ‘nano-paint technology’ which repels dirt before it gets a chance to take hold on the paintwork. It is set to be an option on future models but is being tested in Britain on the new Sunderland-built Nissan Note which went on sale in October priced from £12,100 to £17,100. No price has yet been set but it is likely to be around £450 ($750) – or similar to a metallic paint option. 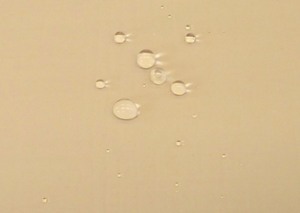 Scientists have developed ‘super-hydrophobic’ and ‘oleophobic’ paint, which repels water and oils. It has been applied to the all-new Nissan Note supermini to create what it calls ‘the world's first self-cleaning car’. The Note already features a ‘wash and blow dry' function on its rear view camera. This uses water and compressed air to automatically keep the lens free of dirt and ensure the Notes' safety sensors work in all conditions. Chief marketing manager Geraldine Ingham said; ‘The Nissan Note has been carefully engineered to take the stress out of customer driving and Nissan's engineers are constantly thinking of new ways to make families' lives easier. Nissan employs 8,500 people in Britain, including 7,300 at the Sunderland factory, 950 at the Cranfield Technical Centre and 50 at Nissan’s European design centre at Paddington in London. SÃO PAULO, Brazil — Even casual soccer fans may already be familiar with the sport’s infamous “magic spray,” the ubiquitous mist that team trainers use on seemingly every type of injury to help stricken — or, as they are occasionally known, faking — players recover from grave maladies without missing a single kick. 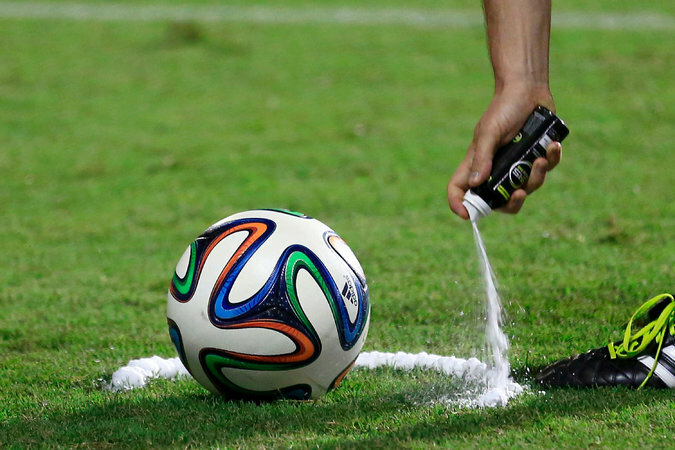 Beginning with Thursday’s opening match of the World Cup here, however, the magic spray will have a new partner in mystical vapor: the vanishing spray. This latest addition to the aerosol array is not a medical tool to get players moving but rather an official’s tool to keep players back. At various points during every game, the referee will instruct one team to stay at least 10 yards away from the ball while the other team prepares to take a free kick. In the past, the referee would make a show of stepping off the required distance before indicating with his hand where the defenders, who often bunch together as a wall, had to stand. As part of its Jotun’s social responsibility initiative to benefit local communities, Jotun Saudi Arabia, the Kingdom’s number one paint manufacturer, used Jotashield ColorLast premium quality exterior paint to protect and beautify the exteriors of houses in south of Old Jeddah. Akzo Nobel NV (AKZA) appointed Maelys Castella as chief financial officer, making her the only female CFO at one of the 25 companies on Amsterdam’s main stock index. Castella, 47, will join Europe’s largest paintmaker on Sept. 15 from industrial-gas producer Air Liquide SA, where she has worked for 14 years and most recently was group deputy CFO, Akzo Nobel said in a statement today. Chief Executive Officer Ton Buechner is leading a broad reorganization to boost profitability at Akzo Nobel, a sprawling company that makes Dulux paints, chemicals and wood finishes. Castella will be the first female CFO and the second woman to serve on the executive committee of a company that dates to the founding of a forge in 1646 and later encompassed businesses created by Alfred Nobel, for whom the Nobel Prize is named. Paint major Kansai Nerolac has appointed Pradip Shah as its new Chairman. The company in a filing with the BSE today said Shah was appointed following the retirement of Dr J J Irani, its former Chairman. Irani also retired from the company's directorship with effect from the conclusion of the 94th Annual General Meeting held on June 20. He served as Chairman of Kansai Nerolac Paints Ltd from July 16, 2003, and as its Non-Executive and Independent Director from October 29, 2002. Woodland Park, New Jersey, June 25, 2014 - Cytec Industries Inc. (NYSE:CYT) announced today that its Board of Directors has elected Daniel G. Darazsdi to the position of Vice President and Chief Financial Officer of the Company effective August 4, 2014. Mr. David Drillock, Cytec's current VP and CFO, announced in February 2014 his intent to retire by the end of the year. As a result of the new appointment, Mr. Drillock will resign as Chief Financial Officer on August 4, 2014 but will remain with Cytec for several months to assist Mr. Darazsdi with a smooth leadership transition. Mr. Darazsdi, age 54, will serve as the Company's principal financial and accounting officer. Prior to joining Cytec, he had been Chief Financial Officer from 2007 to 2014 of Pharmaceutical Product Development, LLC, a clinical research company traded publicly until its acquisition by affiliates of the Carlyle Group and Hellman & Friedman in 2011. Prior to this position, Mr. Darazsdi worked at Honeywell International for 25 years in numerous senior financial positions including Vice President and Chief Financial Officer of finance transformation and operations, Chief Financial Officer of the company's global Specialty Materials business, VP of Finance and Information Technology for Asia Pacific and a variety of other leadership roles.